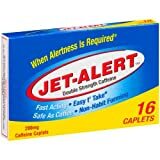 Jet Alert are caffeine tablets marketed to "Restore Alertness". Double Strength Jet Alert contains 200mg of caffeine per tablet and is listed above. The original Jet Alert contains 100mg per tablet. Note: While Jet Alert contains just caffeine, other energy supplements like Optimind have 17 active ingredients to keep your brain alert. Always use caffeine supplements with caution and try not to exceed 400mg of caffeine daily from all sources. Take Jet Alert with plenty of water. 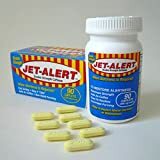 Treat Jet Alert like any medication and keep it well out of the reach of children. There are reports of caffeine overdose every year with supplements such as Jet Alert to poison control centers.